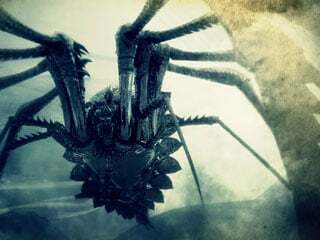 Armor Spider is a Boss in Demon Souls. The Armor Spider, as a fireball spitting arachnid, is evidently well-protected against fire, especially Firestorm. For those determined to use melee despite her taking significantly more damage from magic, make use of the Sticky White Stuff you should have found earlier in 2-1. Alternatively, for those of a more ranged persuasion, the bow enchantment glitch (detailed in several other places on the wiki) can be used to make this relatively easy fight even easier. Ideal for melee would be a decent magic stat and a crescent/moon weapon, however on a character who has those kinds of magic stats, using ranged magic is just as, if not more, viable. Enchant your weapon with sticky white stuff before going through the fog door. Run through the tunnel while blocking or dodging her webs and fireballs. When you see fire start coming out of her mouth, raise your shield or run towards the entrance. There are a number of places to hide while still being able to attack the Armor Spider with relative safety. There are small alcoves on the sides of the hall, where you can stand and be safe from the spiders ranged attacks except perhaps the web (look for the blocks on the ground). Use the Thief's Ring. As soon as you enter the stage move to the right, hugging the fog. The tunnel curves a bit here and there's a small alcove. Move along the left hand side of the tunnel, shortly after lock on range there is a small spot in the wall which is not covered in cob-webs behind a small pile of rocks (just after the first upside-down dead guy stuck in the cobwebs), in online mode there is often a message here to show it as a safe place, from here the spider's flame attacks will not be able to hit you, the web attacks still may however but this is rare. Hide behind one of the wooden pillars inside her nest. Use the Thief's Ring and the Cloak spell. The spider will stop attacking you if you stay close to the entry fog, you need dodging the attacks already under way. Then you can easily shoot arrows from there without resistance until the spell runs out. *Repeat that pattern until it´s dead, it won´t take long. For this plan to work you must use the Thief's Ring. Distance is the advantage on the Armor Spider. You must have a bow with competent range, such as the Compound Long Bow or Compound Short Bow, and around 80+ Arrows, any other bow (besides the Lava Bow) with high range and damage makes this battle even easier. Equip the Crescent Falchion +1 in the other hand as it has an MP regen affect. As soon as you walk through the fog gate, stand against the left-side wall. Aim your bow and repeatedly shoot the body of the Armor Spider. This strategy should not take too long, however, if you run out of arrows or simply get bored, you can defeat the spider using magic. Walk forward till about half way through the tunnel and lock-on the spider and shoot with soul arrow, be careful not to get too close. Be careful - the spider's attacks are powerful and are frequent, try your best to avoid all incoming attacks, primarily the 'flame-ball attack'. In NG+ the hyper mode with Clever Rat's Ring and Morion Blade can be very effective with a bow. Thief's Ring is required. With the White Bow, Heavy Arrows and 30 in both strength and dexterity, you'll do a good few hundred damage with each arrow. You can bring the Makoto to drain down your HP to 30%. You don't need to be in body form for the extra HP since you'll dodge everything the Spider fires at you. With Hyper Mode active, stand to either side of the hallway while backed up against the fog and fire an arrow. The Spider will retaliate with either fire or web. Dodge it to the side regardless. If it shoots web, don't dodge it right away due to it's slight tracking. The web shot will be followed by a fireball, but you don' need to dodge this since the spider can't see your new location. Sometimes it will retaliate with it's short range attacks. Fire a new arrow and dodge back to the side you came from. Rinse and repeat, this shouldn't take more than a couple of minutes. The Armor Spider has two different modes of attacks. She will use her ranged attacks while the player is in the tunnel and shift to melee when player makes it into her nest. The Armor Spider's main melee attack is a cross-leg sweep. The attack starts with she crossing her two short front legs and sweeping outwards. After 1-3 cross-leg sweeps, the Spider will raise her body and smash down with both front legs coming down straight, perpendicularly. Smash attacks are usually followed by her recoiling slightly, drawing up the flames within her body to unleash a devastating inferno that covers up to half the tunnel. Raising her upper body up and fires a single stream of web towards the player. The trajectory of the web will somehow curve towards the player, given enough space. The web deals minor amounts of physical damage but will encase the player in thick, sticky webs, even if the attack was blocked. While encased in webbing, the player's movement speed is heavily impaired and cannot roll for a duration. If the player is hit by a fireball from the spider, the web burns away, freeing the player. Alternatively, two streams of webbing will be launched to the middle of the tunnel, covering the area in webbing. If the player touches the webs, he/she will be encased in it. The main attack of the Armor Spider is a large fireball that she spits. Finally, it also sprays three fireballs 2-3 times. These fireballs reach only about halfway into the tunnel, and the middle one will always land a little further. The Armor Spider is named after a defensive tactic used by the ancient Greeks, most notably the soldiers of Sparta, the Spartans. It entails forming a sort of wall using a group of soldiers' shields and thrusting at opponents with spears from behind the wall. The wall could also be tilted upward to deflect incoming arrows. After all the hoplites on the Armor Spider are killed, it will slide towards you when you're far away from it, but slide away from you if you're close to it.